Thank you for visiting Chelsea Community Garden's website. The Chelsea Community Garden was inaugurated in 1997 on a vacant corner lot. 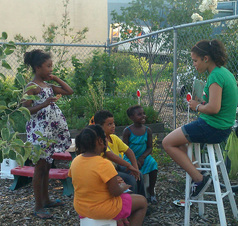 Today 45 Chelsea families garden in this "Oasis in the City," raising healthy vegetables and children. Apart from growing plants, the Chelsea Community Gardeners Association also creates collaborations with many community organizations in Chelsea, such as the YouthBuild-JustAStart program, ROCA, Chelsea Girl Scouts, Chelsea Senior Center, MGH Healthy Chelsea, Chelsea Public Schools' Intergenerational Literacy Program, Chelsea Cultural Council, Chelsea Art Walk, Chelsea Boys and Girls' Club, Chelsea Public Library, Urban Rangers, the Chelsea Community Schools, among others. The Chelsea Community Garden is a project of GreenRoots, Inc. Interested in joining the Chelsea Community Garden? Marina provides childcare at a Summertime meeting. Come join us in our efforts to create a healthy space for Chelsea families. First, check out the "Gardeners Information 2016" to read our By-Laws and Garden Rules. We are a totally membership-run organization. Our "community" garden means just that; our members contribute time and energy to the garden's up keep, attend several meetings per year, volunteer on the Steering Committee and participate in garden projects such as the "Scarecrows in the Garden" exhibit in the Chelsea Art Walk. To sign up or for more information, please send an e-mail to chelseagardens@greenrootschelsea.org. 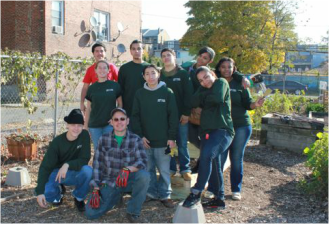 Chelsea Community Garden is a project of GreenRoots, Inc.
2014 was the "Year of the Fruit" in the Chelsea Community Garden. We'd like to extend a special thanks to photographer Melissa Shook. Most of the photography on this website is hers. Additional photography by Misty Florez, Rich Cuthie, Margaret Carsley, Joe Rubin, Maureen Cawley and Alexandria Christmas.